Mail4Rosey: Stop Throwing Away Money! Label Daddy has Options! Stop Throwing Away Money! Label Daddy has Options! How many times have your purchased a new jacket/sweatshirt, mittens, a hat or a lunchbox for a child and had it turn up missing almost right away? If you head on in to your child's school and peruse the Lost & Found items, you'll see that it's really not that uncommon. In fact, I've never been to an elementary school that didn't have tons and oodles of items unclaimed. To me, that's like throwing money away! Stop tossing cash in the trash by labeling your child's items! They also have multi-sized packs you can purchase, camp packs, luggage tags, you name it. We've used Label Daddy for a long time now, and I've never never never been disappointed. They stick when they're supposed to, peel when you don't need them anymore, and they even have labels that go in your shoes! You can get photo stickers too, and those may just be my fave! Label Daddy is not just for kids. They also offer labels for adults to use as well. 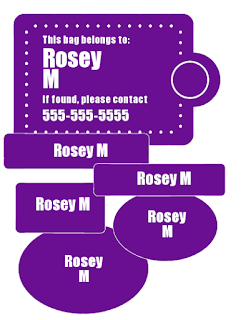 Label that garbage can, the recycle bin or even make return address labels. AND you can make allergy stickers too, which can be oh so important if you're sending your child out and about where there is going to be food served. The site also has numerous fund raising options. 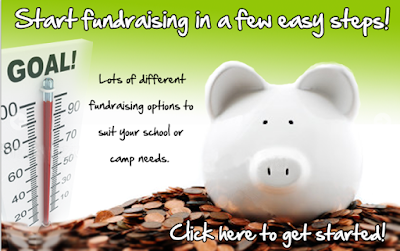 If you're looking for an easy way to start a fundraiser for your school, yep, they do that too! Take the grunt work out of getting your fundraisers ready and turn to Label Daddy who already has so much of the work done for you. You get a nice percentage of every item sold for your fundraising goals. There's a lot to love about Label Daddy. Head on over the website to see what all they have to offer. We really appreciate the options, and if you're in the need of any kind of label, I think you'll like them too. Stop throwing away money on lost items. Keep 'em with the help of Label Daddy. You can also follow along on Facebook and/or Twitter. Good way to keep things from being lost forever indeed. When you become a parent, you quickly learn that EVERYTHING your kids own need labels! I label everything that goes out of the house with my boys. Otherwise most of it would never come back. I have something like this and it is a LIFE saver for sure! You need to label all your kids products or they will be lost! We could really use this at work. Everyone is always so disorganized! Those labels will help a lot when you're trying to get organized. There are so many possibilities! I love labels! Thee look really fun, too! Thanks so much for introducing me to them! What an awesome idea! I love that you can put a label with your contact details on it. Definitely perfect for parents with toddlers. I have to label everything! I would love to have a label maker to mark all of my son's stuff. These labels come in handy wonder if this would be handy of keep track of kids socks too ? I could use this. We have twins and its very important that we always label their stuff. The first line hit me like a cannon ball! lol I need to check Label Daddy right now! I need to label everything for my kids. We spend way to much with all the lost items! This is a nice idea/tip. Labeling is always a big help. Love these labels. It just makes sense to have your name and contact info on children clothing and toys. I have never heard of this! I have kids, so this will come in handy. I'm an organization freak!!! I need to have these! I'll be checking out Label Daddy! I'd love to have my file folders properly labeled. It gets crazy when I am trying to find a document! Thanks for letting me know about Label Daddy. I have different kinds of labels. IT's important to have it especially qwhen school begins. I love this! I always have my kids label things or write their names on their items before they leave the house. These are awesome. We tend to need labels for everything with the kids.